« Pentax K-1 camera price increase? A YN585EX supports receiving wireless signal from the master unit of AF-360FGZ, AF540FGZ II and other Pentax cameras. It also supports 4 channels, off-camera TTL and manual flash. YN585EX supports FEC, FEB, Rear-curtain Sync and Red Eye Reduction. GN58@ ISO100，105mm；supports TTL, M and MULTI mode. 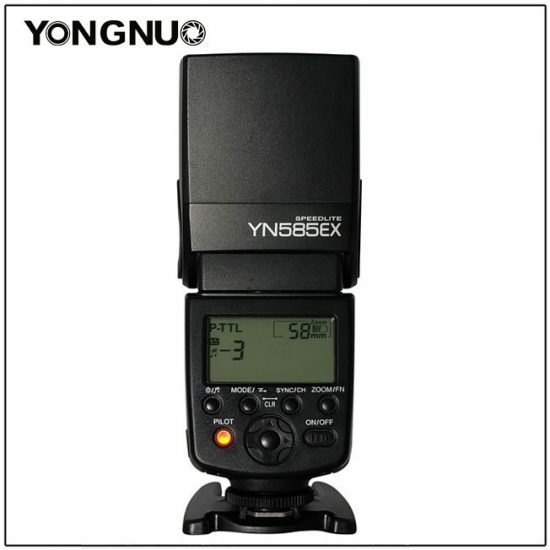 YN585EX can be triggered through the camera, wireless triggered by the built-in flash or master flash, or triggered in S1/S2 pre-flash avoidance mode. YN585EX is equipped with USB port. It’s convenient to visit the official website of YONGNUO, download the latest firmware and upgrade the speedlite. Supports auto and manual zooming, the flash can coverage can be changed between 20~ 105mm. The Charging recycle time is 3s when the speedlite is used with maximum output power. The charging recycle time is about 4~5s even the speedlite is not used with brand new batteries. It’s convenient for you to know how the battery status for YN585EX supports real-time displaying the electric quantity. YN585EX is equipped with AF Assist Beam. Quick focus is easily to be realized in dark environment. Check Yongnuo YN585EX pricing and availability at Amazon (not available at the time of this post). This entry was posted in Flashes and tagged P-TTL, Yongnuo YN585EX. Bookmark the permalink. Trackbacks are closed, but you can post a comment.